oke, so seagull,you are a she,sorry i always thougth you are a man. nothing wrong with that,i married a she. because my english is not that good and sometimes diffeculd to place what i i want to write and what i read. but i am also at a dutch modelbuilders forum,and there can i do everything in my own language,and than i can also being sarcastic,while athers don't see that,and we have again a argument. so thats why i ask, if it was sarcastic. thanks ralf,to make me feel not the only one with the language problem. aber das gleiche habe ich auch mit der deutsche sprache,weil ich fahrer bin (aber nicht mehr soviel in deutschland),werde nur der wurde gebraucht die mit meiner job zutun hatte. wan ich das afschreibe muste, werde das auch slimmer fur mir. Hey Thijs, that correction would be a hard job . The Dutch syntax is totally different to the German, so writing is difficult. Speaking and hearing is more familiar. But your sentences are well understood, so it is totally O.K..
Don't forget: The Dutch people normally try at least to speak German, while the Germans normally don't think about speaking Dutch. They expect, that all Dutch people understand German!! For me is a rule, that i try to speak English until someone offers to me to speak German. The younger Dutch people prefer English, of course. it was more of a try for me to whrote german,that can correctet by you if you want . i the 7,5 years that i have drived in germany there ware just a vew that try to speak dutch,one of them was a BAG beambte (bundes autobahn gestapo) as we called it. but with hands and feets and a little bit of stonecole german we manage it. When you first joined the forum I didn’t know if Thijs was a man or a woman’s name! I used to be working a lot with men in the days when there weren’t many women in some science and engineering jobs. and mayby in northern belgium. Just last week I was really wishing I still had a dirt bike. I love Rolf...so sparkling silver!!!! 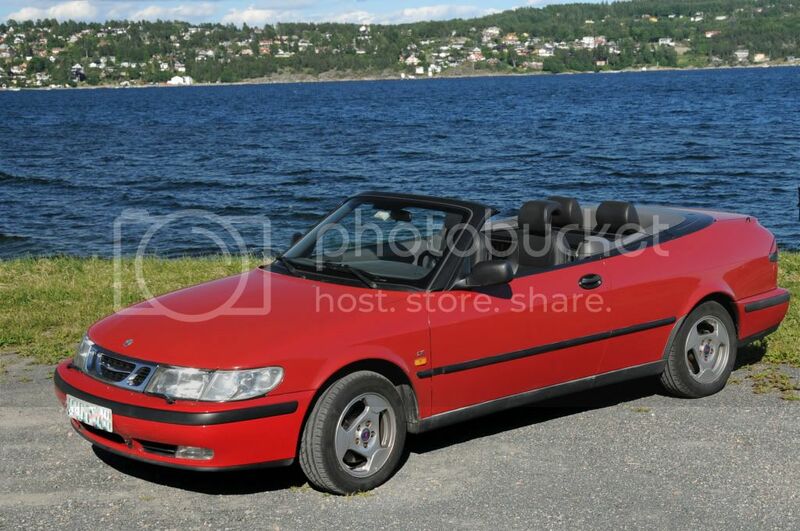 SAAB 9.3 convertible Birthday present to myself when passing 50 some years ago. Ahhh.... summer... convertible... perfect combination! We were actually talking (a lot) about convertibles on the ferry last night.... The Chief Engineer wants one too. You might have explained it before, Jan-Olav...., but my age prevents me from remembering where ( )....: Your car...., the Opel...., why 'Rolf' ? ?